Need a quick and easy dinner on the table in less than 30 minutes? 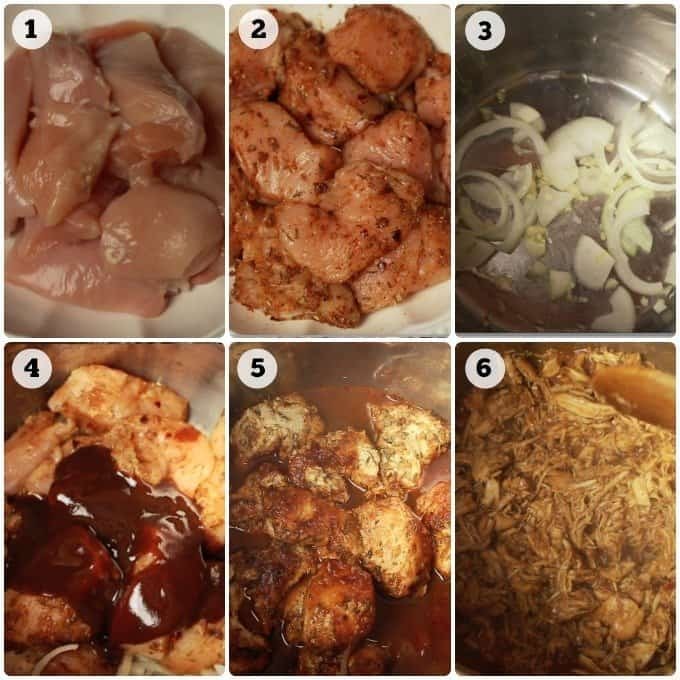 Make this easy Instant Pot BBQ Chicken with flavorful boneless chicken thighs (or breasts), a few seasonings, and barbecue sauce. This is one healthy weekday or weeknight meal the whole family will love! I’m still so in love with my Instant Pot. Like, seriously in love. I adore it so much because it doesn’t seem to matter what ingredients I put into this little pot, everything turns out well. Unlike this past Sunday at the 2017 Oscars, when Warren Beatty and Faye Dunaway announced the wrong best picture winner, no mistake can be made with my Instant Pot. 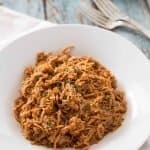 This shredded BBQ chicken is such an easy recipe, you’ll wonder why you didn’t make it before now. Flavorful boneless chicken thighs are dry rubbed with a spice mixture, put in the pot with a little BBQ sauce, then just press a button to cook for 20 minutes. Quick weeknight family dinner in less than 30 minutes! Since getting this Instant Pot, preparing meals has definitely become easier. I’m not trying to brag about my skills here, it’s really just all about the pot. 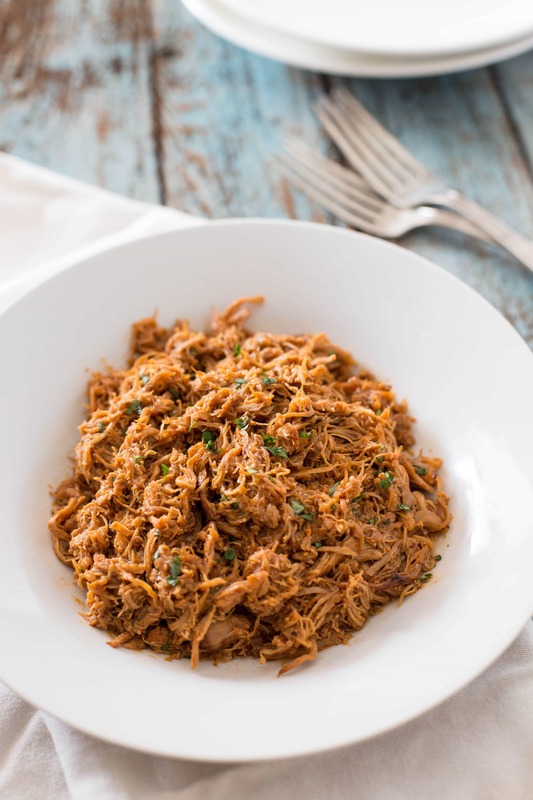 I made this Instant Pot Shredded BBQ Chicken one Sunday, when we wanted barbecue but there was no way we were going outside in 20F degree weather, through the 10 inches of snow, to try to smoke or grill some meat. So out came the Instant Pot and in went some boneless chicken thighs, seasonings, and homemade barbecue sauce. Less than 30 minutes later, dinner was on the table. The result was flavorful and tender chicken meat, lightly coated in barbecue sauce, and seasoned to perfection. That was a helluva lot easier than braving the cold and smoking the chicken outside for 4 hours. It’s possible a thicker, sugary based BBQ sauce could burn in the pan. If you are using a super thick sauce, try adding up to 1 cup of water or stock to your pot to thin the sauce out so it doesn’t burn. Some Instant Pots just simply seem to take more liquid than others, no matter what you are cooking. If yours is like that, then add up to 1 cup of water or stock (total) to the recipe. I use an Instant Pot DUO60 6 quart 7-in-1 and I don’t have to put any additional liquid in it, ever. Seriously, sometimes I just throw meat in it with some seasoning, seal it up, and press a button. Check out my video on this recipe and you can see how much liquid my chicken released during cooking. And that was with no water or stock and only 1/2 cup of BBQ sauce! 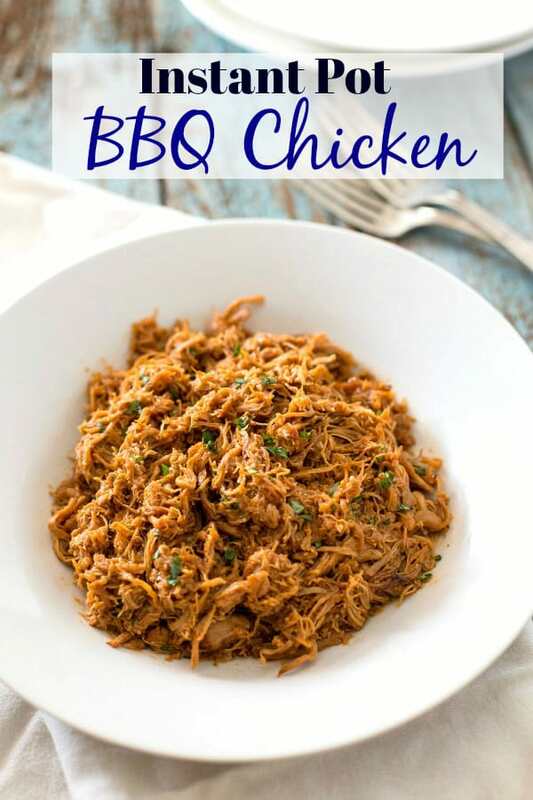 Grab your pot and make this easy, quick, and healthy Instant Pot BBQ Chicken in less than 30 minutes! Leftovers make wonderful lunches for the rest of the week too. Try my homemade BBQ sauce in this recipe and if you need a great side dish that can be made ahead of time, try this easy 7 layer salad. 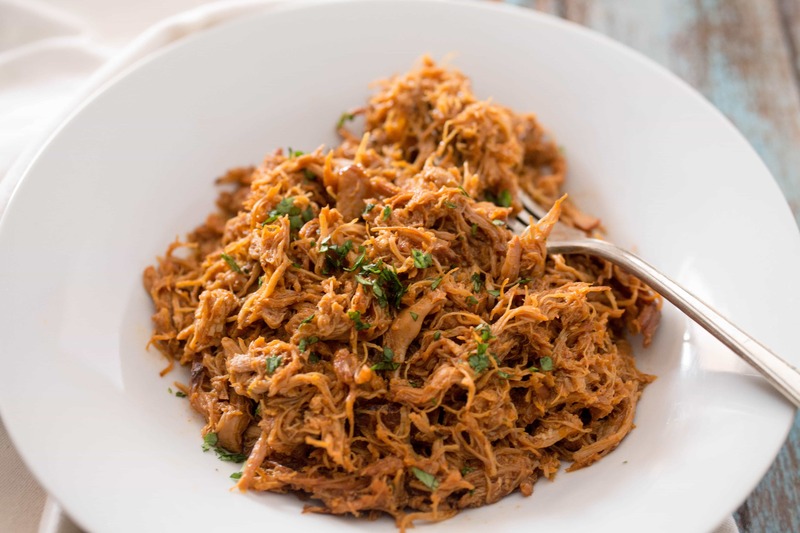 Let me know if you’ve tried this Instant Pot BBQ Chicken in the comments below & happy instant potting!! 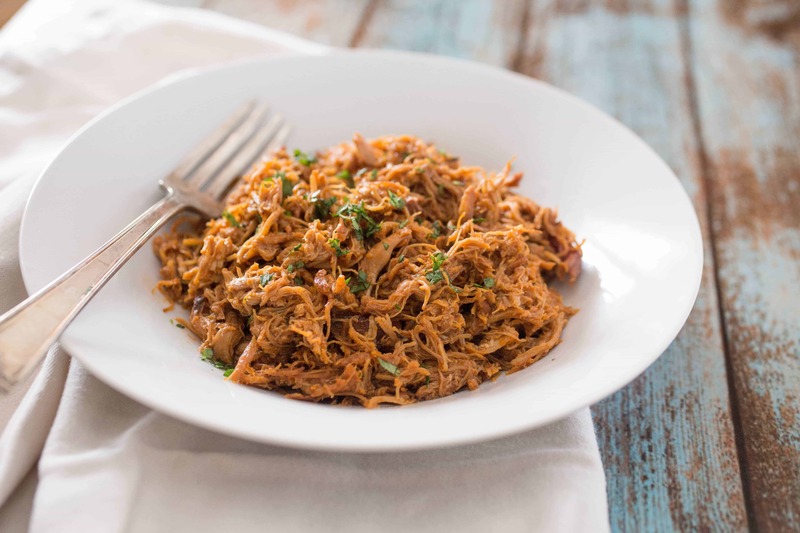 This instant pot bbq chicken is a healthy, quick and easy weekday or weekend dinner that's on the table in less than 30 minutes! Place all the trimmed chicken thighs in a large bowl and set aside. In a small bowl, mix together all the spices and use to evenly coat all the thighs. Set aside. When pot is finished, wait 10 minutes for it to cool down or release pressure manually by taking a hand towel and carefully opening up the steam value on the lid. It is safe to open once all steam has been released. If there is cooking liquid left in in the pot, remove the lid and turn on the sauté button on. As the liquid is evaporating, take two forks and shred the chicken thighs. Continue shredding and mixing until all the chicken is pulled apart and the liquid has evaporated. Can mix in extra bbq sauce, if desired, and heat through for another minute or two. Turn off the pot, serve immediately and enjoy! 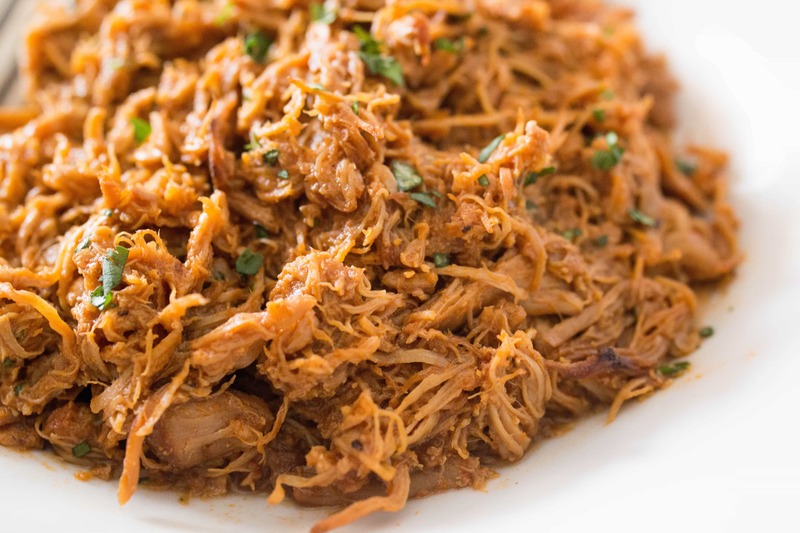 The instant pot BBQ chicken looks good. It would go well with my diet as I keep my carbohydrates to a minimum. I’ll keep the fat from the thighs though as I like the texture and taste of it. Oh, and wow, the Oscars mistake was like a comedy sketch, unbelievable. Okay. THIS GIRL is ALLLLL ABOUT this life – shredded goodness get in my face hole! But seriously, chicken and I have a constant love affair……… Can’t stop. Won’t stop. This chicken looks fabulous! I’ve been craving some bodacious BBQ and this would totally do the trick… just got to figure out the IP sitch. Wow – this chicken looks fantastic, Karrie! I could just see myself putting that on a bun with some coleslaw and going to town. LOVE! I wish it was 75 here and all the snow was gone! I think we still have a couple of months to go! I don’t have an instant pot, but I think they sound wonderful! This bbq chicken sounds wonderful too! I actually can’t remember the last time I watched the Oscars, but I did see that disaster this year on the news. I can’t even imagine. I really need to get one of these Instant Pots! I would have had to brave the freezing weather and snow to get to my grill to bbq some chicken because I don’t have one. It’s pretty cool though, that you got a bit of a break with that warm weather and smoked you up some ribs! I wish I was invited to that dinner! I need an Insta Pot, too! This looks fabulous! Nothing like good BBQ! Ally hail the InstantPop, amirite!? This looks like pure perfection. Cannot WAIT to try it out! If I wanted to make this for around 16 adults (meat would theoretically be used on sandwich buns, not over rice), and to make it a day or two ahead of time, what suggestions do you have? I am allergic to chicken but made this for my family. Since I can’t do a taste test myself I was hoping that more of these comments would be from people who actually made the dish and could comment on it, but I made it anyway and the family seemed to like it. I had been a little concerned about the sage for barbecue chicken, but apparently it was fine. I had plenty of liquid, but I used boneless chicken thighs (no breast substituting) and have a fairly thin barbecue sauce. I think everyone wanted to add more sauce in the end, so unless the seasonings change the taste too much, I would think that as long as they liked the BBQ sauce they would like the chicken, and it seemed to be so at my house. Since we have so much leftover I am thinking of freezing some for a quick, pull out the freezer sandwich meat. I guess I am assuming it could freeze well, especially if I add the extra BBQ sauce first so it has more liquid. I’ll give it a try. BTW, I find that the Instant Pot saute feature almost always has to be set on the lowest setting for me not to risk burning things while sauteing, especially since the pot bottom angles to the outside and the oil in the pan doesn’t want to spread evenly. I have an older model so not sure if anything about that has changed. Thanks so much for reviewing this recipe Donna and very happy the family liked it! Yes, the leftovers freeze well and I’ve kept it for up to 2 months that way. Thank you on the advice on the IP too! I rarely write reviews. Unless a product or service is either horrible or fantastic. THIS recipe is fantastic!! I am so very pleased with the whole thing. It was well received by my 5 year old grandson and my 65 year old hubby! The IP timing was perfect. The seasonings were what drew me to this particular recipe. I was somewhat wary about using all those herbs and spices, in addition to the BBQ sauce. So, I reduced the onion powder and paprika to 1 tablespoon each, and full amounts for everything else (but no pepper flakes). Next time I’ll use the proper amount of onion powder but keep the paprika to 1 tablespoon. It added just enough spice for my family. I’ll also use my home-made BBQ sauce, although Baby Ray’s was pretty good in a pinch. I really can’t say enough good things about this recipe! Thank you for developing and sharing it. I can’t wait to try this with pork and beef! Yum ! ! And I suppose I should check out your other recipes! Glad this made the fantastic list Barbara! lol! Thank you so much for taking the time to comment and SO HAPPY you and your family liked the recipe. You’ve made my week already with your kind words and I’m forever grateful for your support! If using breasts, would I still use 3lbs? Hi GIna, yes you can still use the same quantity of chicken. Chicken wasn’t done. It needed to cook another 20 minutes. Well worth the wait! Everyone enjoyed this very tasty recipe! Hi there! Thanks for your review! Quick question for you: did you use bone-in chicken for this recipe? Just curious as to why it took longer than 20 minutes to cook through. This was an easy recipe. I liked the idea of cooking the chicken in some BBQ sauce and then layering some more afterwards, if desired. The sage flavor was overpowering. I would probably just leave it out in the future or reduce to 1/2 teaspoon. Thank you for sharing! Thank you Marla and very happy you liked it! This may be a dumb question, but I just got myself an IP. Am I able to half the recipe or is that too little for a 6 quart pot? It’s perfectly fine to half the recipe. I actually made this last night for dinner in my 6 qt IP and used 1.7 pounds of chicken breast with 1 cup of BBQ sauce and it turned out great! Hope you enjoy it! Weird question but what if you don’t own an Insta Pot? Would it work with a crockpot? Thanks. Hi Becky, I haven’t tested this recipe using a crockpot, but don’t see why it wouldn’t work. Use all the same ingredients and cook on low for about 5 hours, or until chicken reaches an internal temperature of 180F degrees. Please let me know how it turns out for you! I never tried this before and after reading this amazing post I think I must give it a try. Thanks so much and when you try it, please let me know how you like it!